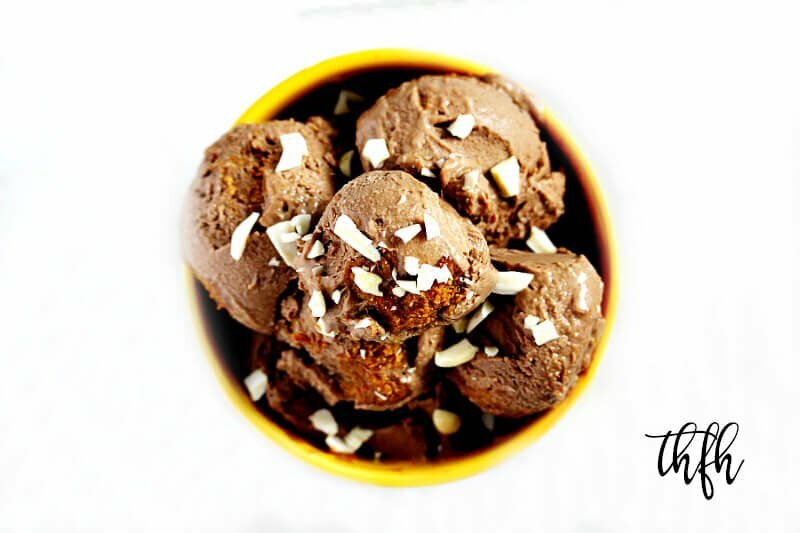 Enjoy an easy, creamy dessert recipe with this Lectin-Free Vegan Chocolate Avocado Ice Cream with Almond Butter Swirl! It’s a dairy-free, vegan chocolate ice cream made with healthy fat from avocados, and has an almond butter swirl (or almond butter chunks, depending on the type of almond butter you use) mixed in. Either way, swirls or chunks, you get some in every bite! This super easy recipe takes less than 5 minutes to make with a Vitamix and the hardest part is waiting for it to firm up in the freezer. Typical Ingredients: Milk, Cream, High Fructose Corn Syrup, Sugar, Whey, Buttermilk, Guar Gum, Gellulose Gum, Carrageenan, Alkalized Cocoa, Monoglycerides, Diglycerides, Polysorbate 80, etc. You can enjoy this healthy dessert because it’s made with clean ingredients and is raw, vegan, gluten-free, dairy-free, lectin-free, egg-free, soy-free, no-cook, paleo-friendly and contains no refined sugar. Want more healthy dessert recipes? 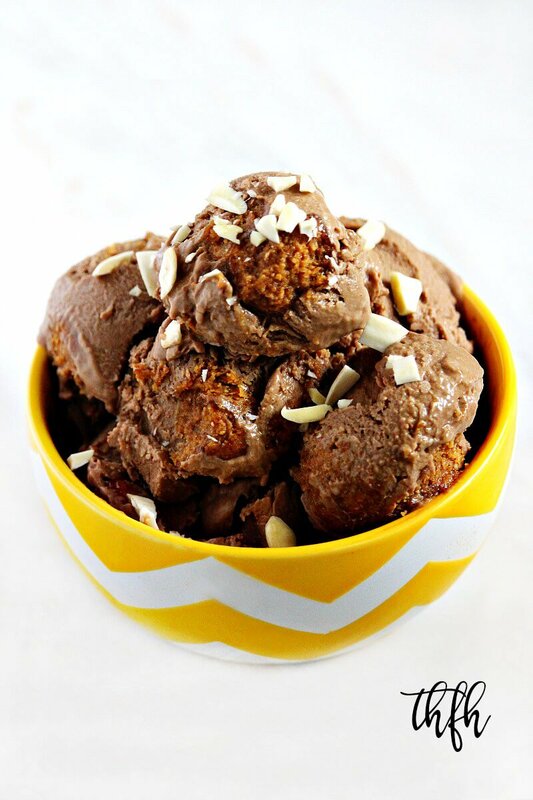 Check out Gluten-Free Vegan Chocolate Turtle Ice Cream, Gluten-Free Vegan Vanilla Bean Ice Cream, Vegan Strawberry Ice Cream or my Clean Eating Cookbook with 3 entire chapters of healthy, clean eating dessert recipes just like this one that you will love! Add all ingredients for the ice cream to a Vitamix and blend until it's creamy and smooth. Adjust the amount of sweetener to your preference. Transfer the mixture to an ice cream maker and process according to your machines directions. Add all the ingredients for the swirl to a small bowl and stir until well combined. Set aside. When the ice cream maker is finished making the ice cream, transfer the mixture to an air-tight BPA-free, freezer safe ice cream container and spread evenly. Option 1: If your swirl mixture is thin, drop a spoonful of the swirl on top of the ice cream and using the tip of a sharp knife, swirl it into the ice cream mixture. Option 2: If your swirl mixture is thick, take out a small amount at a time and roll it into small balls (you should have +/- 30 tiny balls). Drop the balls into the ice cream mixture, spreading them evenly then push them down into the the ice cream with a fork or flat edged spoon. Cover your container and place in the freezer for 2-3 hours, or until it gets to the hardness you prefer. The recipe and photographs for "Gluten-Free Vegan Chocolate Avocado Ice Cream with Almond Butter Swirl" by Karielyn Tillman of The Healthy Family and Home website are licensed under a Creative Commons Attribution Non-Commercial No Derivatives 4.0 International License and cannot be used without my written permission. Hi – I am eating lectin free but am changing over my pantry as budget allow. What can I use in place of the xylitol and date syrups in this recipe, while still being lectin free (or close). I have monkfruit and stevia currently. Obv at some point I’ll have to make the switch to Swerve as I keep seeing it. But I’ve never come across date syrup before. Thank you! Hi there Deanna! I know how hard it is to re-stock a clean eating and/or lectin-free pantry so I applaud you for taking that big step in the right direction! While in the process of creating new and revising some of my older recipes to lectin-free, I’ve been using either xylitol and/or date syrup, as they are the only lectin-approved sweeteners I have experience with. Dates are approved (in moderation) in Dr. Gundry’s book and date syrup is made from 100% dates – I use it as a liquid sweetener replacement for maple syrup. I’ve also been using the xylitol for a replacement for a granular sweetener. I don’t have any experience, or luck, with using monkfruit and especially stevia. If you were to try one of those, I would go with monkfruit, since it is granular and you could use it as a substitution for the xylitol in the ice cream recipe and even as a substitute for the date syrup in the almond butter swirl. But, I don’t know how much to use as a substitute so you may need to add just enough for your personal preference. I have never been able to get stevia to work in my recipes so I don’t use it and wouldn’t know how to tell you to convert it to use in the recipe.